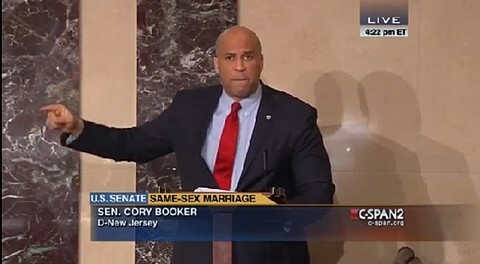 New Jersey Senator Cory Booker delivered an emotional, impassioned speech on the Senate floor Monday night urging the Supreme Court to rule in favor of marriage equality. 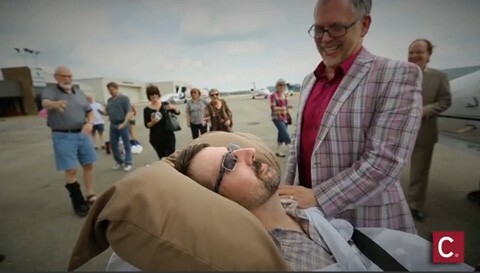 Booker's speech took as its centerpiece the story of Jim Obergefell and the late John Arthur, the gay Ohio couple who in 2013 flew to Maryland to marry on the airport tarmac before Arthur's death from ALS because Ohio wouldn't allow their marriage. Obergefell is a plaintiff now in one of the cases that SCOTUS will be hearing on April 28. Said Booker: "We cannot fail now. Love is on the line. Citizenship is on the line. We cannot deny the worth of one American without denying the worth dignity and strength of our nation as a whole." Senator Sherrod Brown (D-OH) followed Booker with an excellent speech of his own.